What an Remote IT Support in Perth can do for your business? Remote IT Support Perth is one of those amazing works in our IT team. The service helps you to provide an effective and express solution to your IT related issues without even extracting a transport related cost or time conflicting issue. With the help of modern technology, we can directly support your remote desktop problem anywhere and anytime without on-site support consultation. All you have to do is to make sure that you have an internet connection and call us on +61 8 6555 6664. Lets take it a little deeper! personnel are doing to your desktop since you will both be sharing the same screen. With the use of tools like TeamViewer, Zoho Assist, live chat, and desktop sharing in skype for business, direct interactions with your remote system takes place. Moreover, you can attend to other non-computer based jobs once all important information is delivered and we have been provided access, allowing us to work on your issues whilst you get to other important matters. Just picture that a physically present technician is working with you side- by- side. Our IT expert can rapidly trace the problem and give solutions to minimise the impact of your business. On the other hand, with Remote IT Support Perth we can revamp and personalize your IT system environment which is hassle free and scalable to your workplace. How safe and secure is Remote IT Support Perth? At some point, you may feel sceptical about the security of your desktop by providing us access and wondering who else can access my pc? Throw that dubious or doubtful mindset straightaway! We guarantee that it is 110% totally secure! Our connection methods use the latest in proven technology and the highest encryption methods such as AES-256 bit encryption. Our technicians also cannot access your desktop until you click and allow them access. Upon completion of the work, simply closing the software such as Team viewer will end the session and also close any active connections to your desktop. Rest assured that it’s just between client and support computers working. We ensure that we provide a thorough number of encryption methods to prevent anyone else seeing what’s going on to your device. We can no longer access your desktop once our IT personnel have logged out of your computer. Unless you are requesting for another remote support service and accept our remote access software to run again. Our service doesn’t end there! Our remote monitoring service ensures consistency of your software, applications, networks, or other related IT systems. Therefore, thriving business to focus on their daily matters and operations. Meaning we provide around the clock monitoring services just to resolve or upgrade systems and ensure smooth running of your business operations. Share your screen with us to show us the problem quickly and easily. Our mission is to drive our client’s businesses to new heights. By serving them the latest technology and providing seamless, scalable, and swift remote IT support Perth. 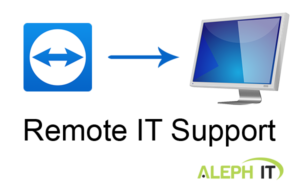 For a quick solution to your remote desktop problems Consult Aleph IT for remote IT support Perth! We are also willing to entertain your quotes and queries for free. To know more about Aleph IT services, read IT Support Services. This entry was posted in Aleph IT Services and tagged remote it support, remote it support jobs, remote it support services.